A V S Subrahmanyam, popularly Known as AVS is famous Comedian and director in Telugu Film Industry. Who has acted so many movies and directed few movies like Super Heros. Aradhyula Venkata Subrahmanyam popular as AVS made his debut into films through 'Srinatha Kavi Sarvabhoumudu'. However, the first film that hit the screen was 'Mr Pellam'. Incidentally, both the films were directed by Bapu. 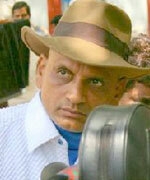 AVS had started his career as a journalist and later entered into films. He himself proved as a good comedian and won the hearts of audiences with his inimitable style of comedy. AVS also tried his hand as a director through 'Super Heroes, Ori Nee Prema Bangaram Kaanu and Roommates'. Whenever there were stage shows and other such big film events, he used to play as the compere and anchor. This versatile artiste, comedian, director and anchor is going to be felicitated by Sangam Academy in association with Suchir India at Ravindra Bharati on October 15. A book 'UthineÃ¢â‚¬Â¦' would also be released on the occasion.